Appweb is the fastest embedded web server for securely hosting embedded web management applications for the Internet of Things. With HTTP/2 support, it is blazing fast and has extensive security controls, sandboxing and defensive counter-measures. Read why Appweb is unique and perfect for the Internet of Things. We also provide docs for previous versions. Kickstart for Appweb is a free, working, sample device management application that you can use as your starting point for an embedded web server. Kickstart employs best practices for dynamic, responsive embedded web applications. For more information, read Kickstart for Appweb. 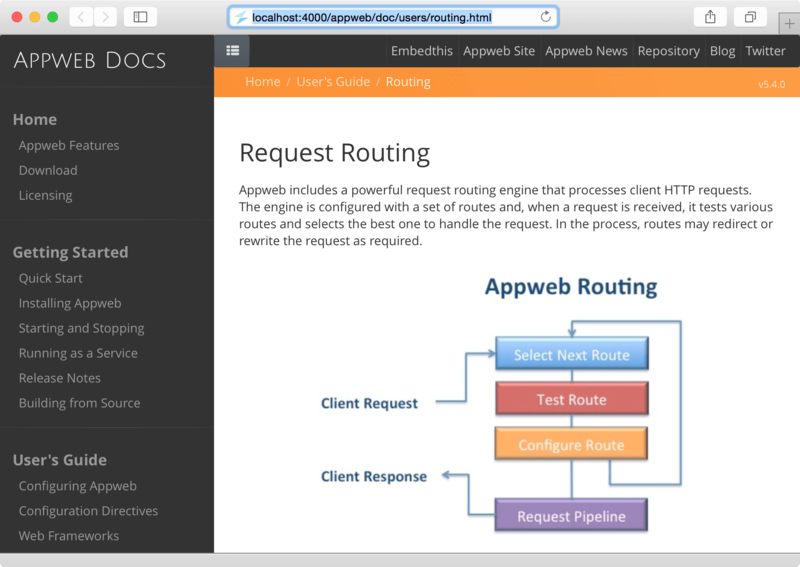 Embedthis Appweb Enterprise Edition is commercially licensed, royalty-free, with complete source code, documentation and samples. We provide free product evaluations using Appweb Community Edition under an Open Source GPL License so you may thoroughly test and understand the software before licensing. Appweb and GoAhead are embedded web servers that are embedded in hundreds of millions of devices and applications. This includes printers, routers, switches, IP phones, mobile applications, data acquisition, military applications, WIFI gateways, factory automation, medical devices and many more. Here is a small selection of who is using Appweb and GoAhead. Enjoy priority support and proactive security patches. Embedthis provides diagnostic help and support for commercial license customers. Contact support@embedthis.com. Read in detail about the Support Options and Subscribe for Appweb updates. Community Edition customers may log bugs and open issues on the Appweb Issue Database.